2004: Urban Orchard Food Swap at CERES. 2009: Bulleen Art & Garden, then Greensborough. 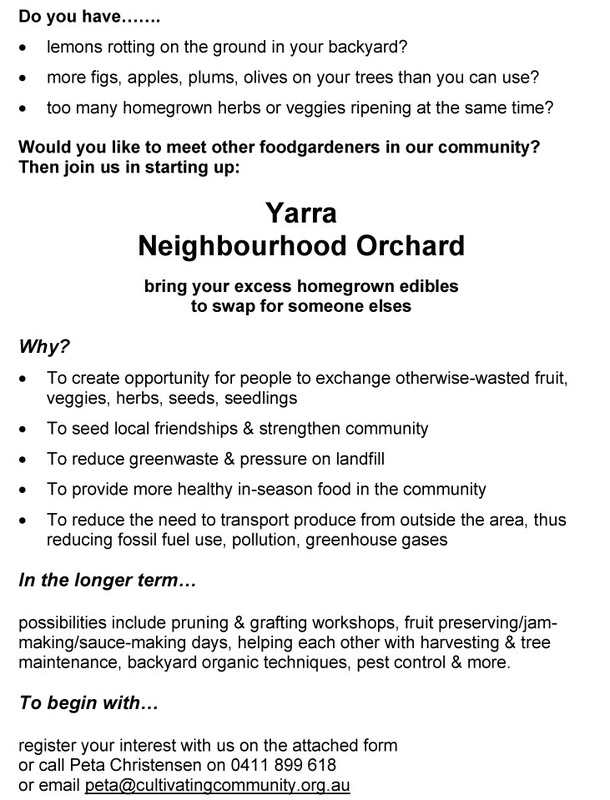 See a 2008 article in The Age which discusses the establishment of a food swap in Footscray. 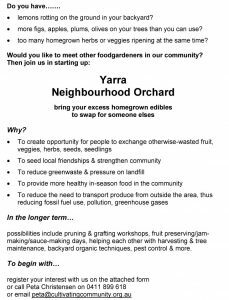 As well as mentioning a swap at Fitzroy, that article also says that the Urban Orchard Food Swap at CERES started in 2004 and was Melbourne’s first. Peta (who, together with Glenda Lindsay and others, started the Fitzroy swap in early 2008) says: “I think it is safe to say that CERES were the first official food swap followed by Fitzroy. My husband Chris Ennis actually started the Urban Orchard idea at CERES after noticing a lot of fruit from trees being wasted around our neighbourhood in Thornbury. He started thinking that perhaps the people who planted the trees had moved on and a new generation of people had moved in who didn’t know the value of their trees, how to care for the trees, or what to do with all the fruit. He wanted to develop an easy way to re-distribute that food and support people to keep their fruit trees and think of them as an asset rather than a burden. After talking to people at CERES, the idea for the Urban Orchard swap table was born. The CERES model is about people dropping off their produce and taking something else whilst they are at CERES doing their Saturday shopping whereas the Fitzroy Urban Harvest is more about creating a monthly event that would bring people together with the sole purpose of swapping produce and also catching up with other gardeners in their neighbourhood.” Peta also sent me their original 2008 flyer (pictured right)! The Diamond Creek swap started in 2011 and ended in 2018. Here is what its organiser, Pam Jenkins, had to say: “Diamond Creek Food Swap ran for 7 years, having commenced in March 2011. Over the years, the originators of the swap and other Diamond Creek enthusiasts moved away from the area but the swap continued with the support of gardeners from surrounding suburbs until swaps sprang up more local to them and then they, naturally, moved to the swap closer to their home. So, was it worth the time and effort to turn up for a couple of hours a month to co-ordinate the swap? Let’s allow some figures do the talking. “During the first year, 300Kg of fresh homegrown produce was swapped. Lemons (45Kg) topped the list followed by pumpkin (34Kg). That’s a lot of marmalade (or gin and tonic) and pumpkin soup! Then quinces (30Kg). Quinces, really?! Quinces and lemons also made second appearances at the swap as lemon marmalade, quince paste, quince jelly and pickled quinces. Lemons and pumpkin may be moderate value items at the grocery store but how about 18Kg of limes or 7Kg of tamarillos or feijoas that sell at $1 each at the shops. “Swap participants had the opportunity to ‘try before you buy’, with unusual fruits and vegetables such as babaco, Jerusalem artichokes, chokoes, Mexican cucumbers, pepinos, persimmon, spaghetti squash and trombonchino zucchinis making appearances. Some of these items are easy to grow, tasty and productive but are still impossible to buy because they may be delicate, have a short shelf life or are unattractive to shop owners for any number of reasons. “Also, let’s not forget the multiple bunches of silverbeet, spinach, herbs and all the other common fruit and vegetables that people grow and eat. A swap is all about swapping your excess produce for somebody else’s excess. It’s ideal for a small gardener who only has space for two or three types of vegetable to be able to swap for two or three other types, thus enabling them to increase variety in their diet at no extra cost. “The swap wasn’t limited to fruit and vegetables. 17 varieties of homemade preserves and dried foods were swapped, along with 30 varieties of seedlings and numerous seeds. Other miscellaneous items included wood ash, coffee grounds, compost, worm juice, jam jars and plant pots. “Swaps are great places to meet with like-minded people. Gardeners who share their excess produce are a friendly bunch with lots of ideas, advice and experiences to share. We celebrate our successes and bemoan our failures together. The shared experience of dealing with Nillumbik soil, plagues of bugs and feathered or furry marauders leave us shaking our heads on many occasions but somebody usually comes up with a solution or two. There is always next season to plan a new strategy.